Attire: Make sure you wear green or you might get pinched! You can even sport a “Pinch me I’m Irish” button or step it up by wearing a leprechaun hat. Decorations: Include as many green decorations as possible by incorporating green into tablecloths, tableware, silverware, balloons, and streamers. You can even replace light fixtures with green light bulbs or hang shamrock-shaped strands of lights. Activities: Create a treasure hunt for guests to find a hidden pot of gold (chocolate gold coins). You can also create a playlist of Irish songs and have guests sing karaoke. For 21 and older, go to an Irish Pub and celebrate in the most popular way, by drinking a beer! Food: For finger foods, place bowls of green M&Ms, green jelly beans, and Lucky Charms cereal. You should also serve popular Irish foods such as corned beef and cabbage and mashed potatoes. Drink: Serve mint milkshakes, green Gatorade, or green Kool-Aid. 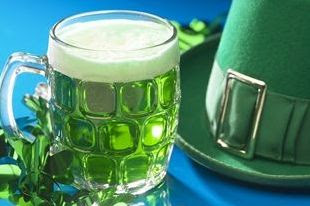 For 21 and older, serve Irish coffee by adding whisky to coffee or serve green beer by adding green food coloring.